On this MLK Day, Villanova receives 63 of 65 votes in the new AP Top 25 on the strength of the two best players in the Big East listed in the post above. However, Oklahoma surges to No. 4 behind two more dominant performances against ranked teams (TCU and Texas Tech) by Trae Young. While the No. 1 spot in the AP poll has rotated between teams, Value Add Basketball calculates the Player of the Year race so far is a blowout - with Young ahead of where Seth Curry was at Davidson and rivaling Anthony Davis as the best college player of the century in all-time ratings that go back to the year before Carmelo Anthony and Dwyane Wade took Syracuse and Marquette to the Final Four. Here are the Top 25 players, ranked by how many points per game they improve their team over what a replacement player would do. The fastest riser in this ranking is Keita Bates-Diop, who has been the most valuable player on the court in 11 straight games according to www.kenpom.com and as of today should give the Ohio State Buckeyes a 1st Team All-American. 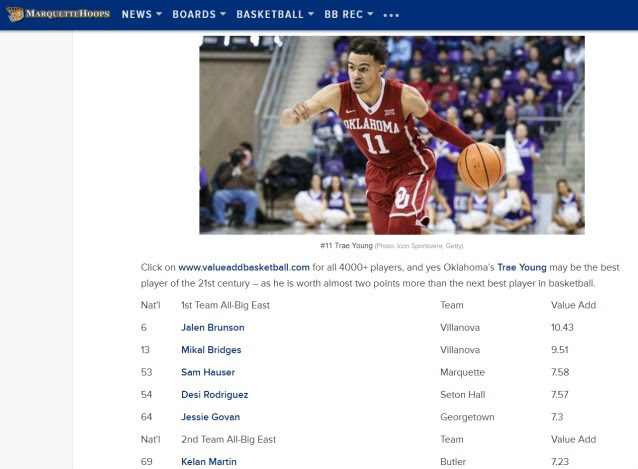 You can click here to sort all 4,090 players this season by conference or the two teams you are watching in a game, or simply look up names to see where your favorite players rank. Email or call 404.606.3163 with any questions.